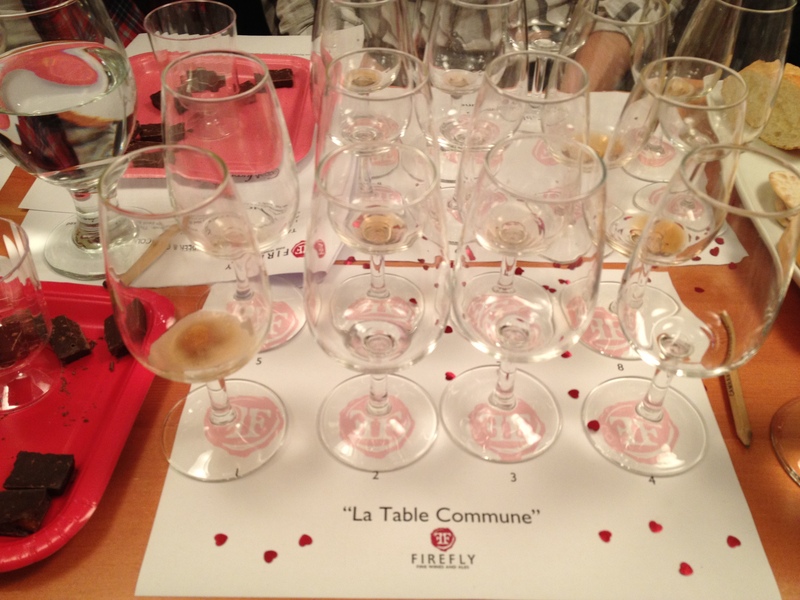 Last night I went to Firefly’s La Table Commune for a crash course in all things Irish and beer; kind of like a “dry” run for beer geek’s Christmas also known as St. Patrick’s Day. And no, before you comment, ask aloud or even form the thought in your brain we did not have any green beer, and no, green food colouring does not enhance the drinking process until at least six pints into the evening. In the place of emerald brews we sampled beers from Ireland and not just Guinness – apparently there are other beers in Ireland, who knew??? The evenings line-up included Ireland’s most popular beer Harp Lager (blanched Guinness …kidding), Kilkenny Cream Ale (best Irish name), Granville Island Irish Red (re-christened Granville Isle for the evening – at least in my mind), Smithwicks Ale (the ‘w’ is silent -thanks Lundy I don’t want to sound like a rookie), Magners Irish Cider (not beer at all), Half & Half (a cocktail of Harp and Guinness), Innis & Gunn Scotch Stout (comes in a green box!) and last but not least and not unexpected Guinness Dry Stout (aka Guinness for light weights). Our Irish beers were accompanied by a nice selection of cheese including Guinness cheese AND an amazing beer truffle from Cocoa Nymph. For instance, even though Ireland=Guinness=Stout in the minds of many 63% of the beer sold in the country is lager – perhaps this is why Harp is brewed by Guinness. At the beginning of the 19th century there were over two hundred breweries, today there are fewer than twelve. Historically Ireland produces ales without hops because the hop is not native to Ireland. 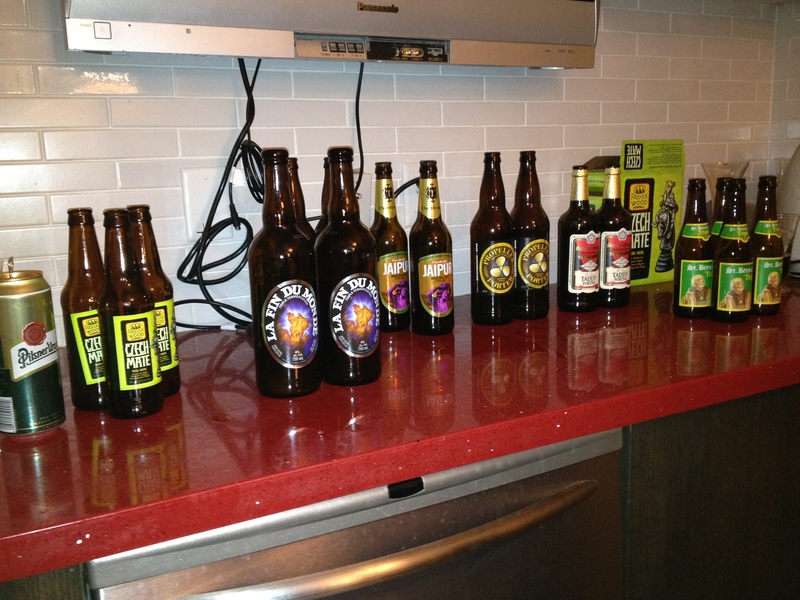 Popular Irish beer styles include Lagers, Cream Ales, Red Ales and of course stout. Guinness pioneered the use of the ‘widget’ (that thing rattling around in the bottom of your beer can) in the late 1980’s to maintain that creamy draught character. Guinness is actually the lightest of the beer selection served in terms of calories and alcohol content. Guinness for health indeed! HARP LAGER: Clear and golden with lots of stiff white head; grape and apple on the nose with a hint of nuttiness; light bodied and crisp with the ever so slightest bitter finish; drinkable but not remarkable. KILKENNY CREAM ALE: Light amber, clear with a decent amount of head; a little sweet malt on the nose; clean and creamy in the mouthfeel but very flat. SMITHWICKS RED ALE: Reddish amber with cream coloured head and good clarity; touch of sour and sweet on the nose; nice malt/hop balance and a bit of depth body wise; subtle bitter finish. GRANVILLE ISLAND IRISH RED ALE: Deeper red colour with lots of white head; definite hop on the nose; smooth to drink with caramel notes and a soapy hop quality; bitter finish. MAGNERS IRISH CIDER: Very, very pale gold, effervescent and clear; sweet apple nose; crisp and easy to drink; sweet finish but not cloyingly so more refreshing and not cooler like, which is a definite bonus. INNIS & GUNN STOUT: Dark reddish brown with a quickly dissipating caramel coloured head; sweet, oaky nose; smooth in body, smoky overtones, lots of whisky flavour; liquor-like finish. GUINNESS DRY STOUT: Deep black and tan with lots of creamy head; roastiness on the nose; very light in body and dry but with lots of flavour notes like coffee, chocolate and roast cereal; bitter finish. HARP AND GUINNESS (Half and Half): Points go to this one for awesome aesthetics for this cocktail; a layered drink with the dark Guinness floating atop the light Harp. HARP AND MAGNERS (Snakebite): I’m a big fan of this ‘radler’ style of mixing lager with something sweet like cider, soda or lemonade; reminds me of picnics and sunshine. In case you missed the title, this post is all about the union of two of the best food groups in the world -beer and chocolate. 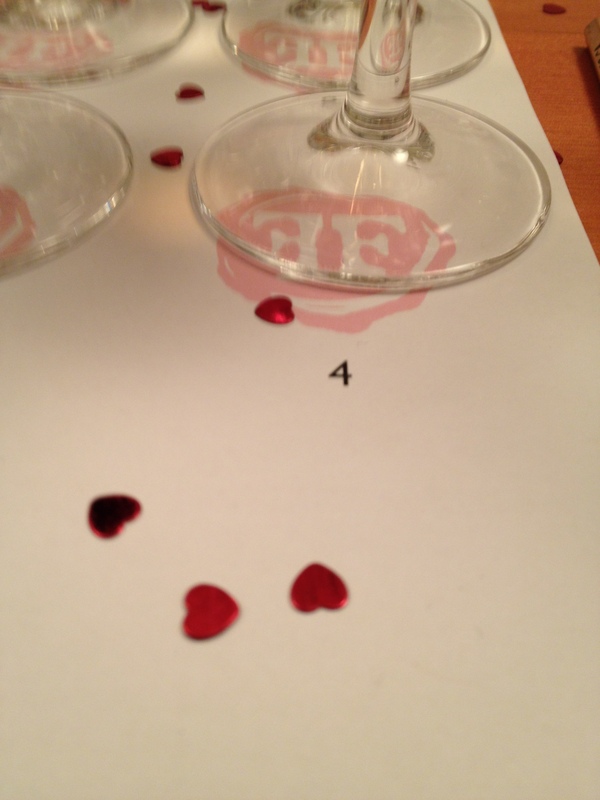 To honour this joining, my sweetie and I attended Firefly Fine Wines and Ales beer and chocolate tasting and (over)indulged in a flight of eight beers paired with a trio of chocolates from Cocoa Nymph Chocolates & Confections. Now wait a minute beer and chocolate? Together? Can that work? Survey says a resounding yes. If you stop and think about it beer and chocolate are not that dissimilar with their composition of sweet and bitter elements. Chocolates can be sweet and milky, bitter and roasty, enhanced with herbs and spices and this is equally true for beers. 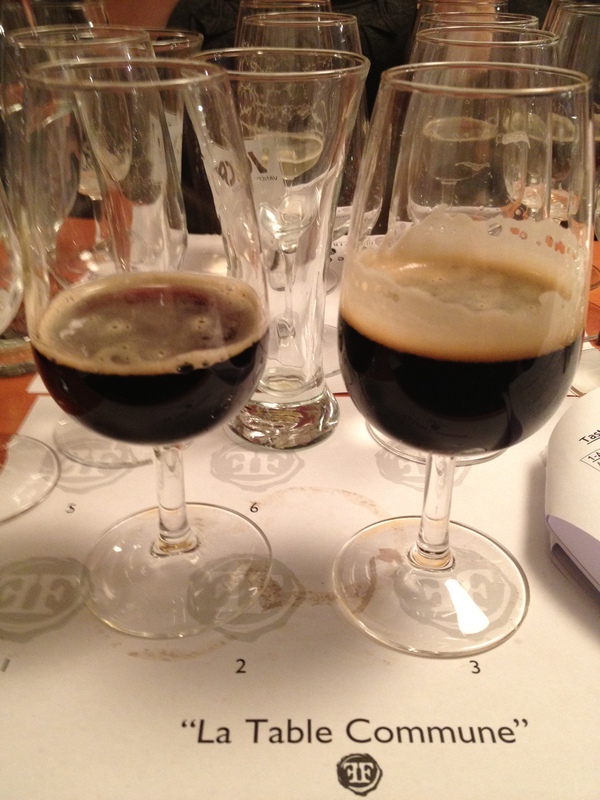 We already know how well chocolate works when it is brewed into robust stouts and coffee porters so it was fun to see what happens when you put the two together in a tasting session. Classic Dark Nymph – 64% dark chocolate with a subtle bitterness. Sea Nymph – 64% dark with fleur de sel and toffee. Twilight Nymph – 45% creamy milk chocolate. Urban Nymph – 45% milk chocolate with coffee and caramelized cocoa nibs. Coney Island’s Albino Python – Lager meets hefeweizen; strong notes of ginger and fennel balanced with malt. Tin Whistle’s Chocolate Cherry Porter – Light bodied Porter with lots of fruit on the nose. 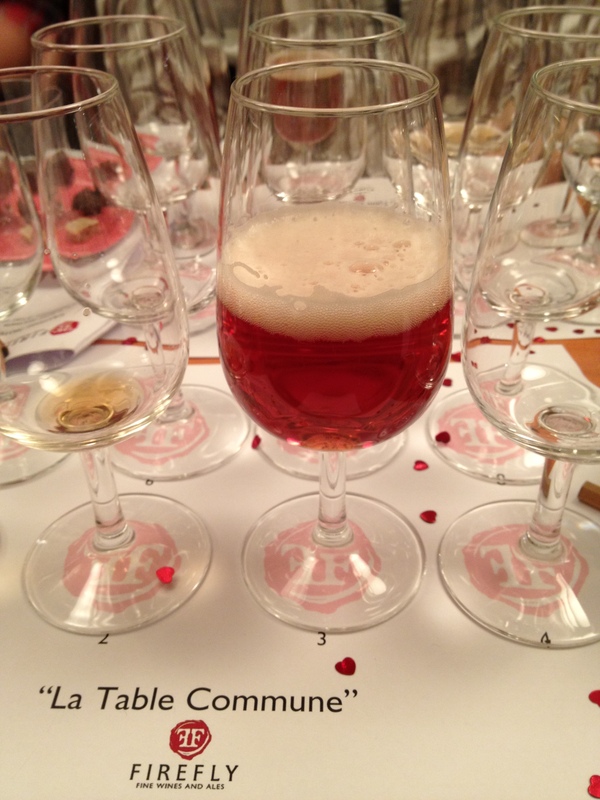 Mort Subite Framboise –Bright, sweet lambic with a hint of tartness. 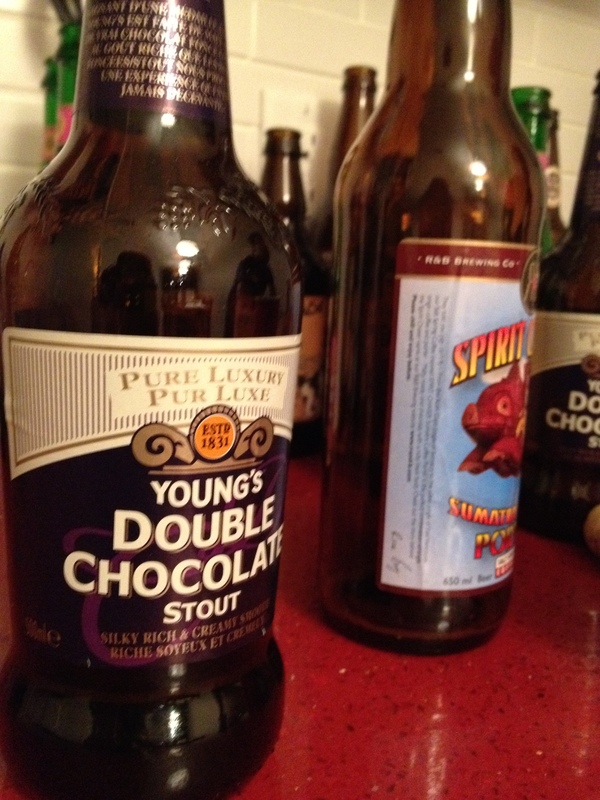 Youngs Double Chocolate – Rich chocolate nose and roast flavour with a bitter finish. La Vache Folle Imperial Milk Stout – Lots of malt and yeastiness on the nose with a creamy mouthfeel. Rogue Hazelnut Nutbrown Ale –Ton of nuttiness on the nose, clean and sweet to drink. Cannery Brewing Maple Stout – Way too syrupy for the amount of body. Intensely sweet. R&B Brewing Spirit Coffee Porter – Subtle coffee nose, tepid with a bit of a bitter finish. 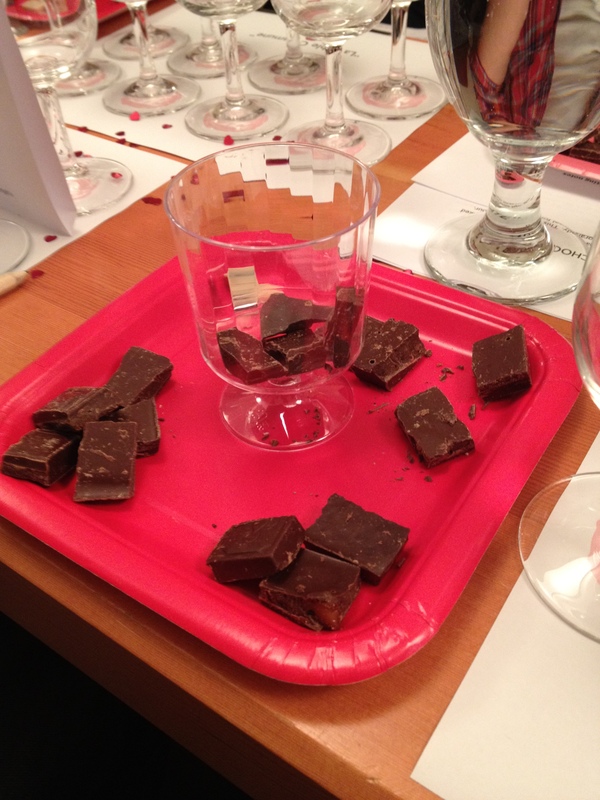 Each taster glass was sampled with three pieces of chocolate chosen to draw attention to how different qualities in the beer are altered when paired with chocolates. At times I had difficulty discerning whether I did not like the taste of a particular beer or particular chocolate or the combination of the two but through some trial and error I perfected the technique of sipping the beer, then water, a bit of chocolate, then water, and finally the two together. It was hard work but someone had to step up! Some of the pairings that worked particularly well include: Chocolate Cherry Porter and the Urban Nymph, Albino Python and Twilight Nymph, Mort Subite Framboise and Garden Nymph, Youngs Double Chocolate and Urban Nymph, Imperial Milk Stout and Twilight Nymph, and Hazelnut Nutbrown Ale and Twilight. A notable few that did NOT work well include: Spirit Coffee Porter and Garden Nymph, Hazelnut Nutbrown Ale and Urban Nymph, and Albino Python and Garden Nymph. 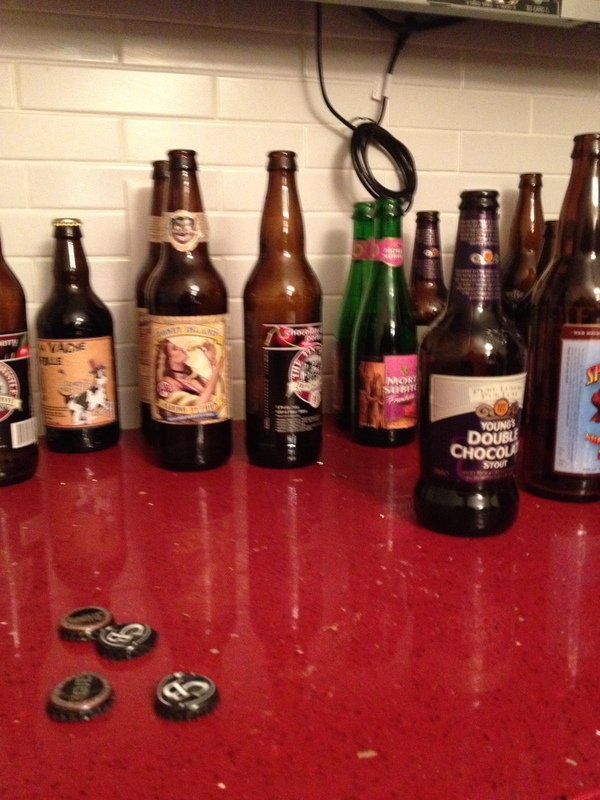 Overall thoughts on the evening: Some beers like the lambic and the maple stout are so flavourful that pairing is challenging since the beer can completely dominate the chocolate. White chocolate was particularly tough to pair successfully while the dark chocolate went well with everything but did little to enhance any of the beers. When pairing beer and chocolate complementary elements seemed to work best as opposed to drawing out bitterness with sweetness. The heavier the beer the more amicable it was to various pairings while the flavours in the lager were noticeably altered by each chocolate. Some pairings just did not work diminishing the tasting experience of both the beer and the chocolate but when it worked it was fantastic. 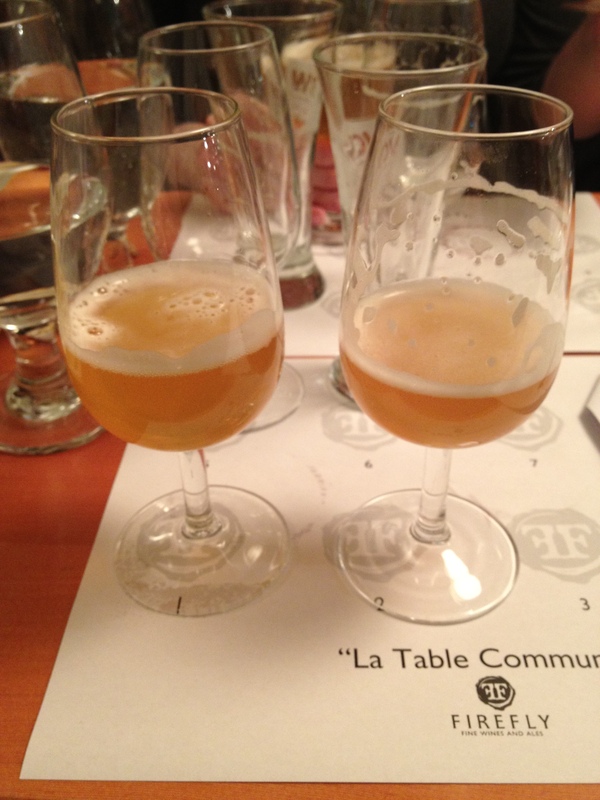 The table commune at Firefly Fine Wine and Ales is hosting a tasting event entitled ‘Beer with Benefits’ showcasing the many diverse flavours cropping up in our ales. From chocolate to pumpkin to acai berry to mint there seems to be no element too unusual to combine with beer. 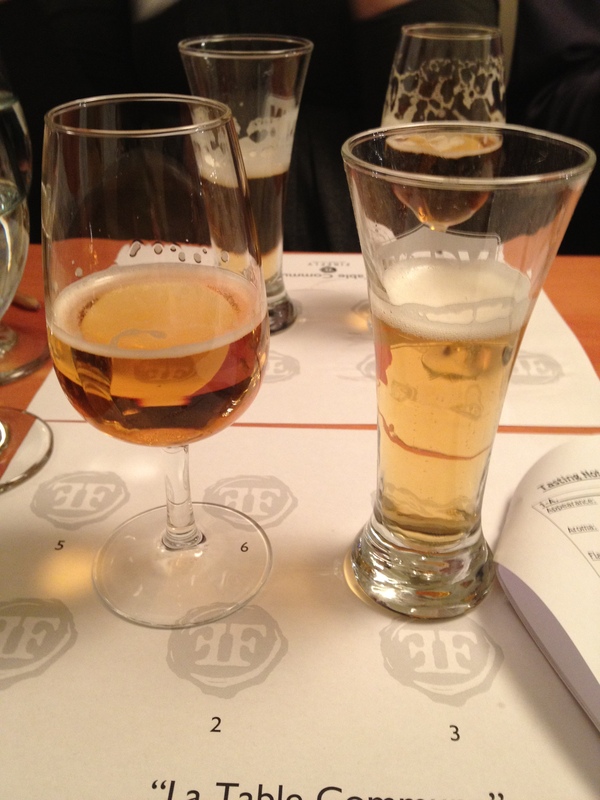 This got me to thinking about some of the less than stellar beer blends I have tried as of late – while the following beers may not have been my favourites I must commend the brewers for pushing the boundaries of taste and convention. 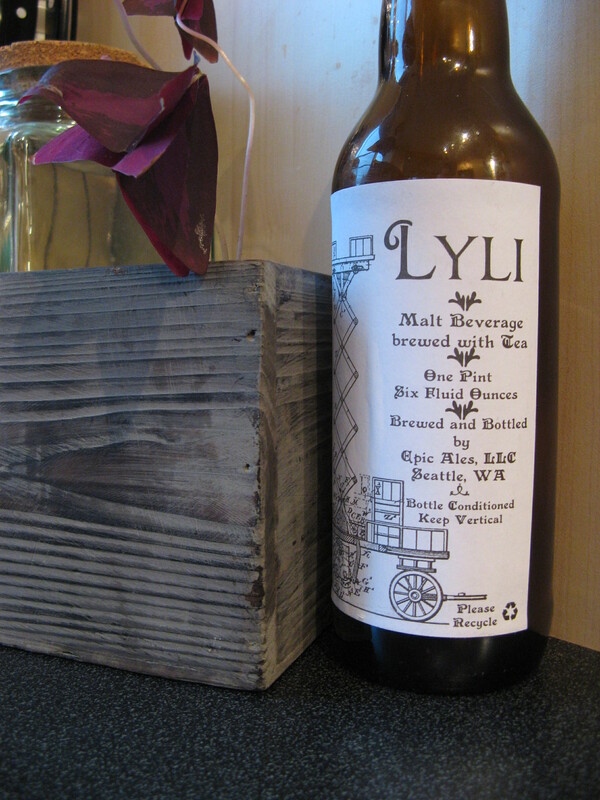 First up, Lyli a ‘Malt beverage brewed with Tea’ by Epic Ales from Seattle. This ale pours a golden orange with a very minimal amount of head. The beer is cloudy and sediment heavy. The nose has a distinct sweetness and an element of burnt toast. 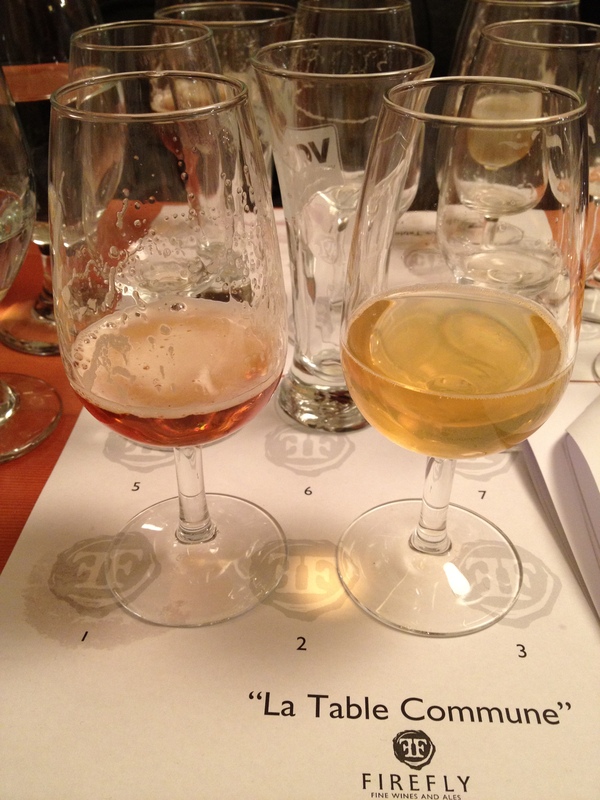 Malt dominates the palate while a tannin-like taste lingers after you swallow. This tannin character reminds me of black tea that has been allowed to steep for too long; it is almost bitter. While I could drink this ale my drinking companions were much more put off by this bitter aftertaste. The best part of this beer is the amazing ingenuity of the label. That being said I am completely game to try some more of the Epic line-up especially the spearmint beer, which came highly recommended but alas was sold out when I tried the Lyli. Second, Dead Frog’s Chocolate Mint Brown Ale brewed nearby in Aldergrove, British Columbia. Did you ever know one of those kids when you were little, you know, the one that always wanted that bright green mint chocolate chip ice cream or the PEP instead of a ‘regular’ chocolate bar? Well I was one of those oddities; I love all things mint and chocolate so once again without really thinking through the taste implications I saw Chocolate Mint Beer and thought TOGETHER AT LAST! This ale is an opaque tawny brown with no real head to speak of. 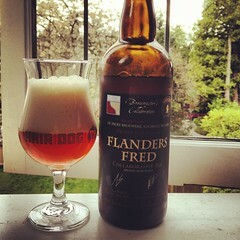 The nose is quite complex; sweetness, mint and nuttiness all come through yet the mouthfeel is somewhat disappointing. The beer does not have the depth of a typical brown ale and it is quite ‘lite’ in character despite the opacity. The mint taste is very synthetic and there are no lingering elements. I even paired this beer with vegan brownies coconut ice cream thinking it would make an excellent dessert companion but the beer could not hold its own.